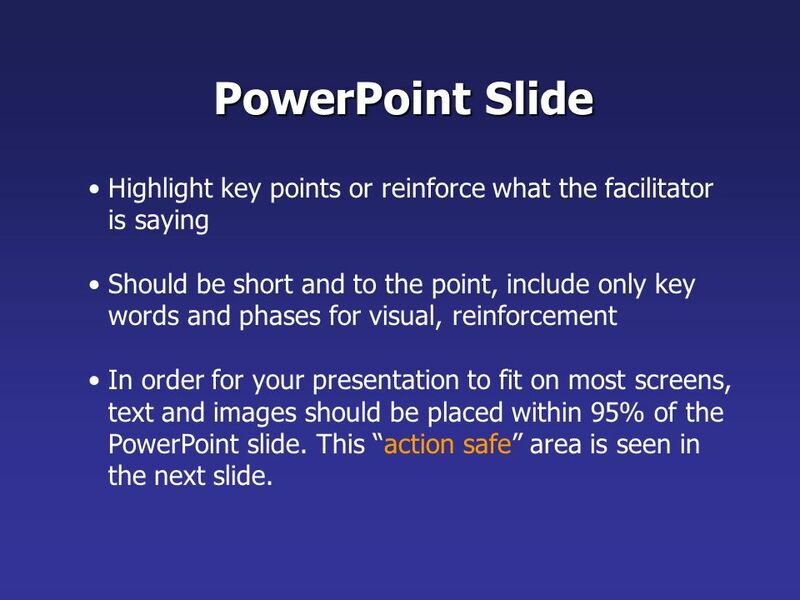 2 PowerPoint Slide Highlight key points or reinforce what the facilitator is saying Should be short and to the point, include only key words and phases for visual, reinforcement In order for your presentation to fit on most screens, text and images should be placed within 95% of the PowerPoint slide. This “action safe” area is seen in the next slide. 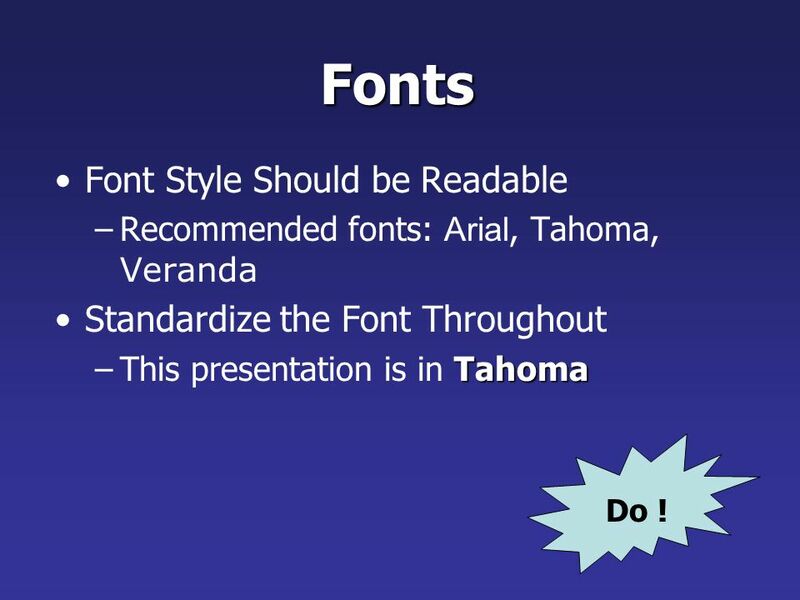 Recommended fonts: Arial, Tahoma, Veranda Standardize the Font Throughout This presentation is in Tahoma Do ! The larger, the better. 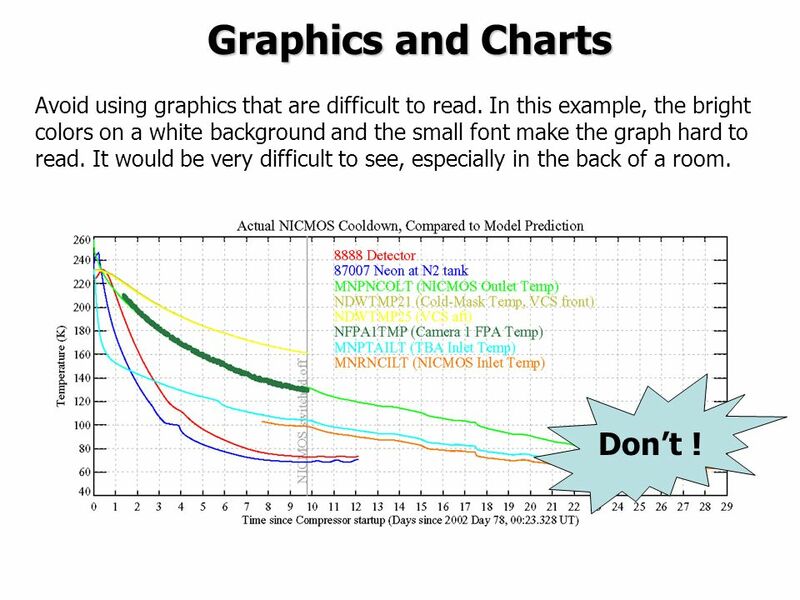 Remember, your slides must be readable, even at the back of the room. 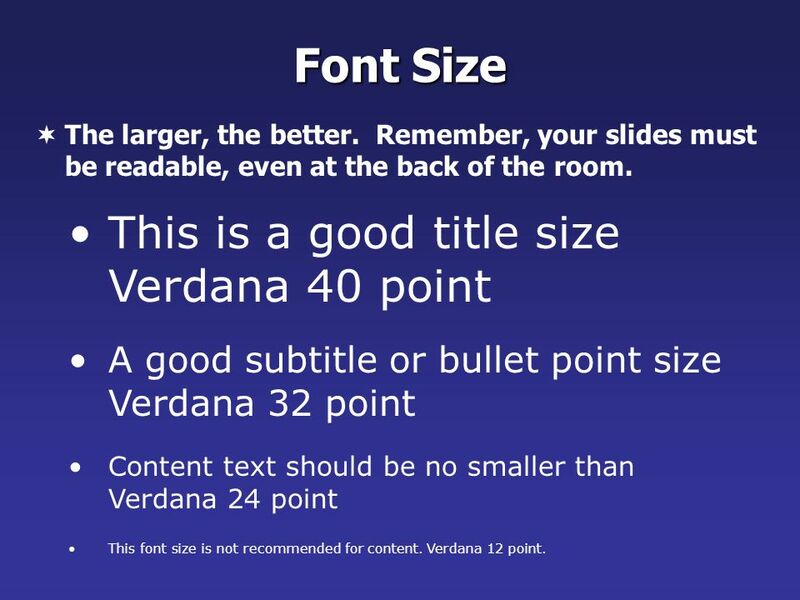 This is a good title size Verdana 40 point A good subtitle or bullet point size Verdana 32 point Content text should be no smaller than Verdana 24 point This font size is not recommended for content. Verdana 12 point. 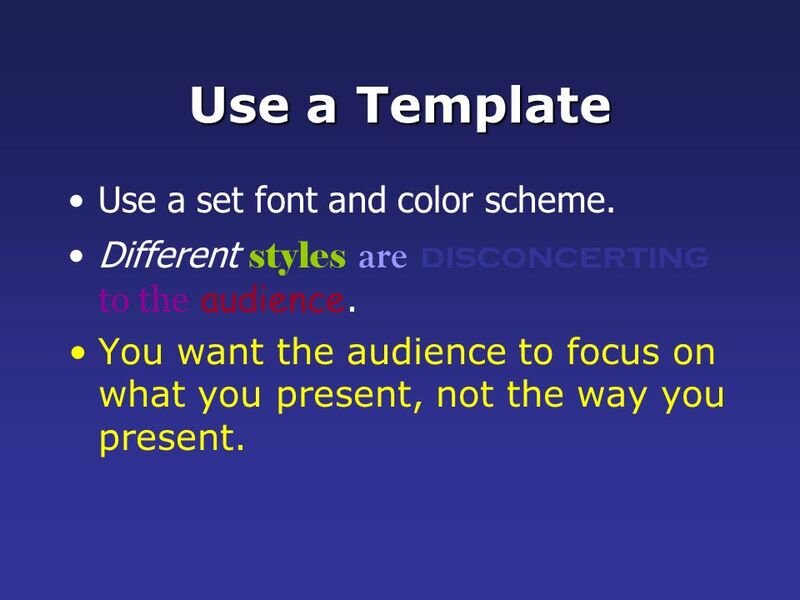 10 Use a Template Use a set font and color scheme. Different styles are disconcerting to the audience. You want the audience to focus on what you present, not the way you present. Changing the style is distracting Don’t! 13 Colors Reds and oranges are high-energy but can be difficult to stay focused on. Greens, blues, and browns are mellower, but not as attention grabbing. 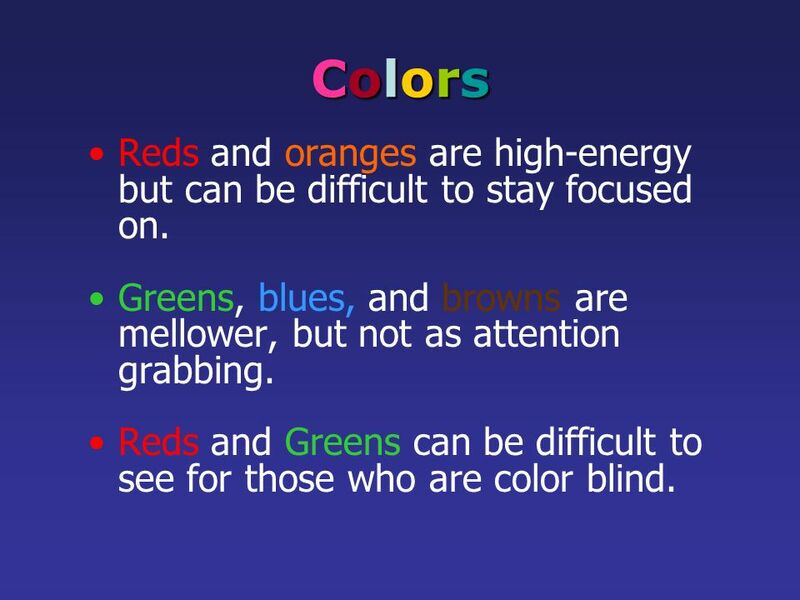 Reds and Greens can be difficult to see for those who are color blind. 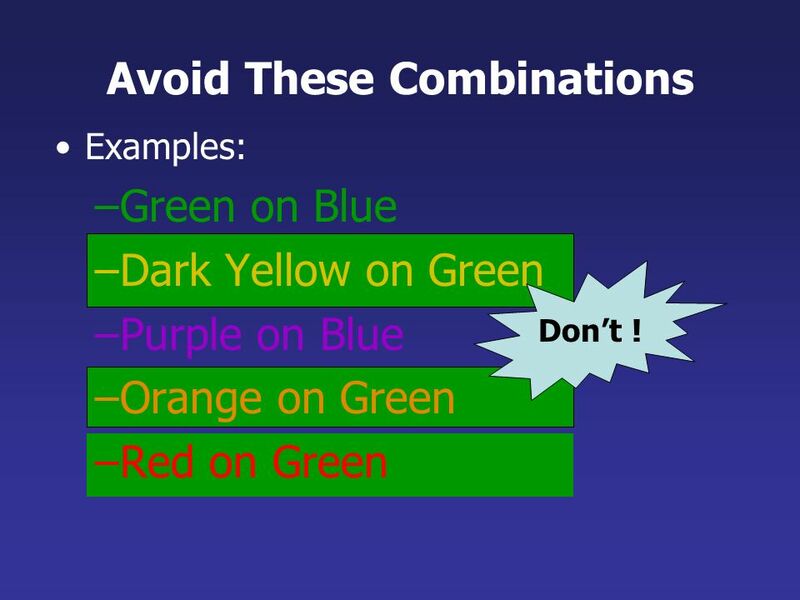 Examples: Green on Blue Dark Yellow on Green Purple on Blue Orange on Green Red on Green Don’t ! 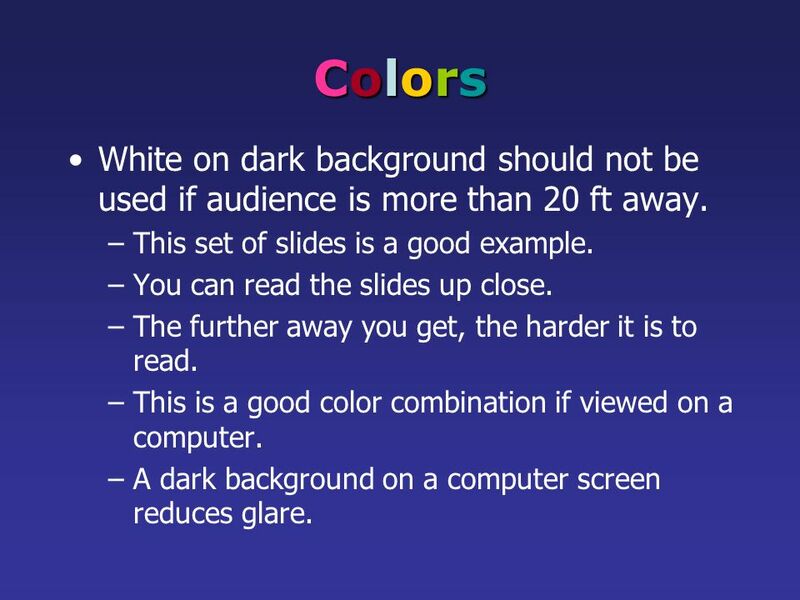 15 Colors White on dark background should not be used if audience is more than 20 ft away. 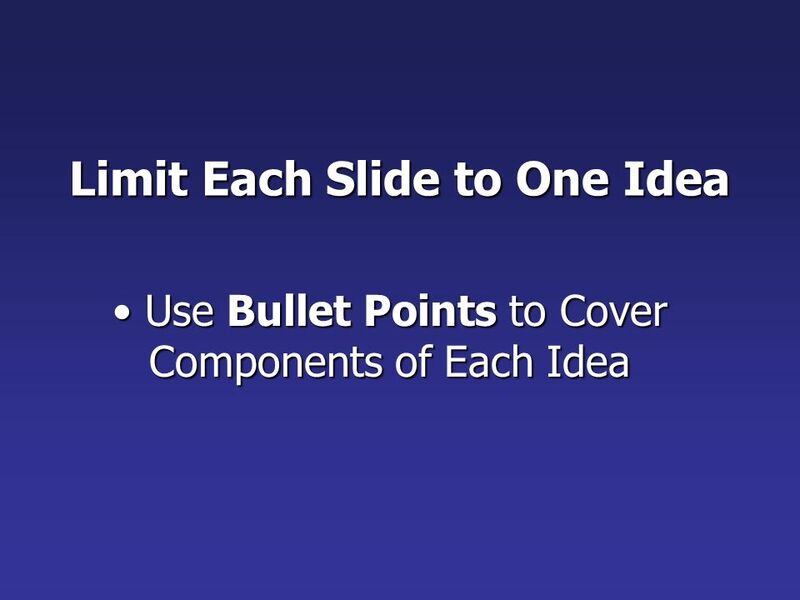 This set of slides is a good example. 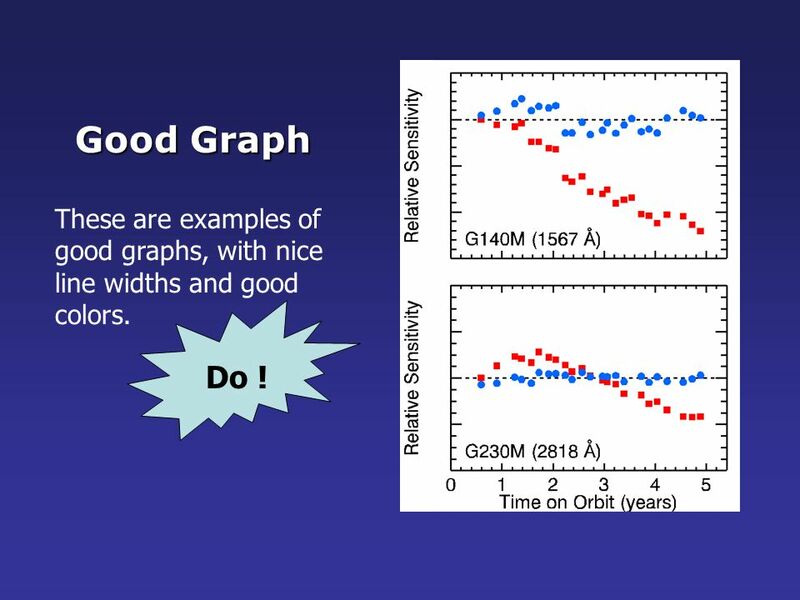 You can read the slides up close. The further away you get, the harder it is to read. This is a good color combination if viewed on a computer. A dark background on a computer screen reduces glare. 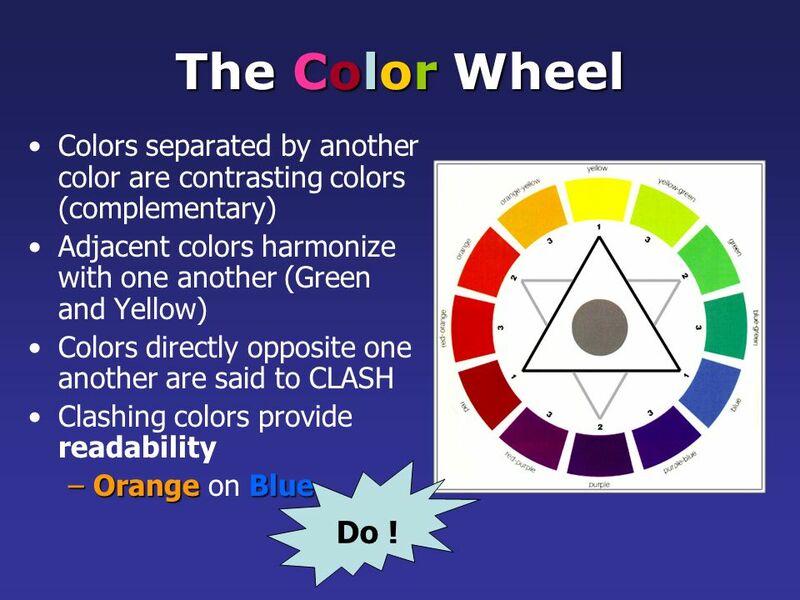 17 The Color Wheel Colors separated by another color are contrasting colors (complementary) Adjacent colors harmonize with one another (Green and Yellow) Colors directly opposite one another are said to CLASH Clashing colors provide readability Orange on Blue Do ! 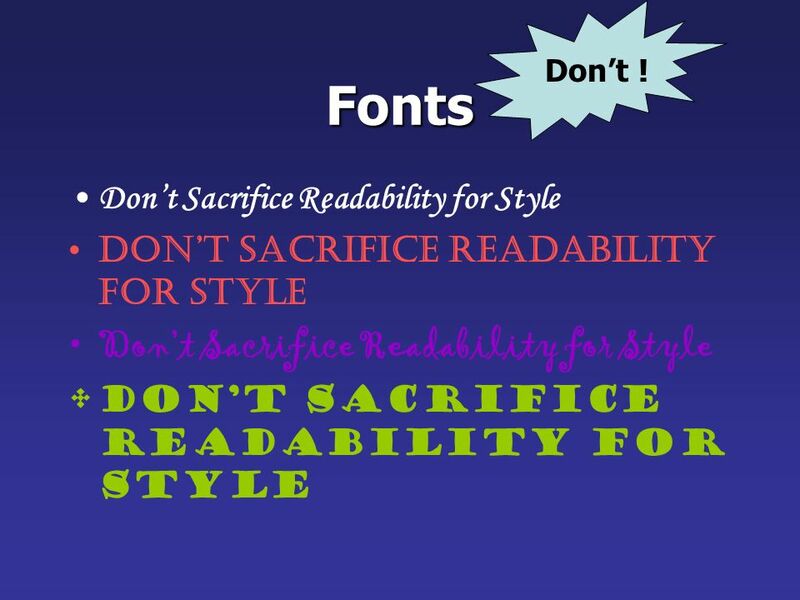 18 Remember: Readability! Readability! Readability! 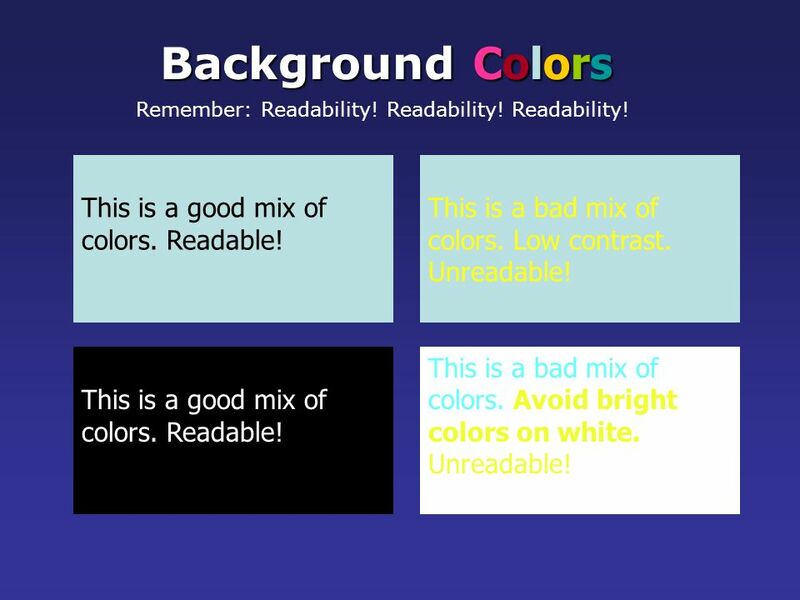 Background Colors Remember: Readability! Readability! Readability! This is a good mix of colors. Readable! This is a bad mix of colors. Low contrast. Unreadable! This is a good mix of colors. Readable! This is a bad mix of colors. Avoid bright colors on white. Unreadable! 19 Make sure the audience can read them! 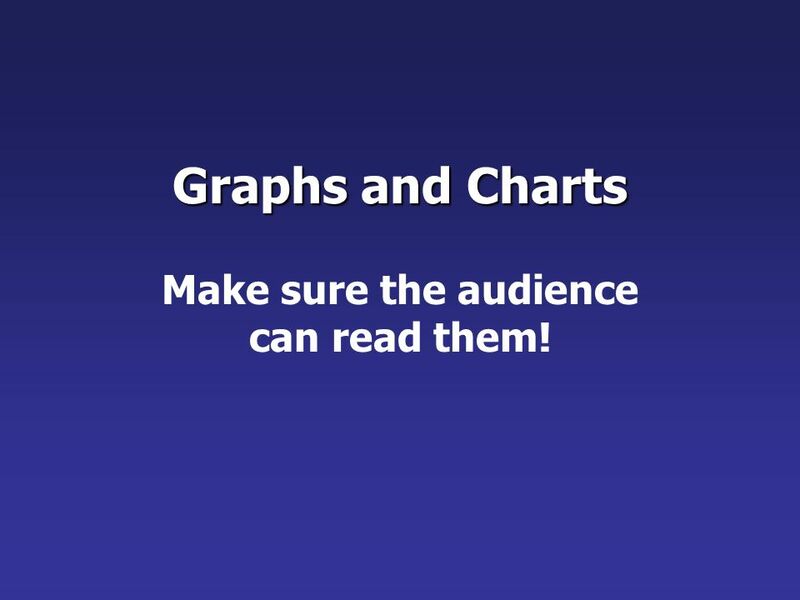 Graphs and Charts Make sure the audience can read them! 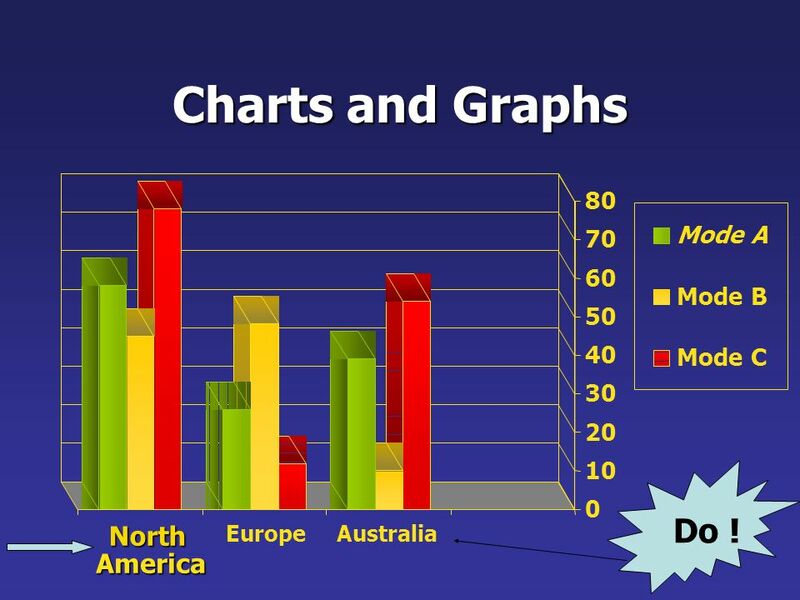 20 Graphics and Charts Don’t ! 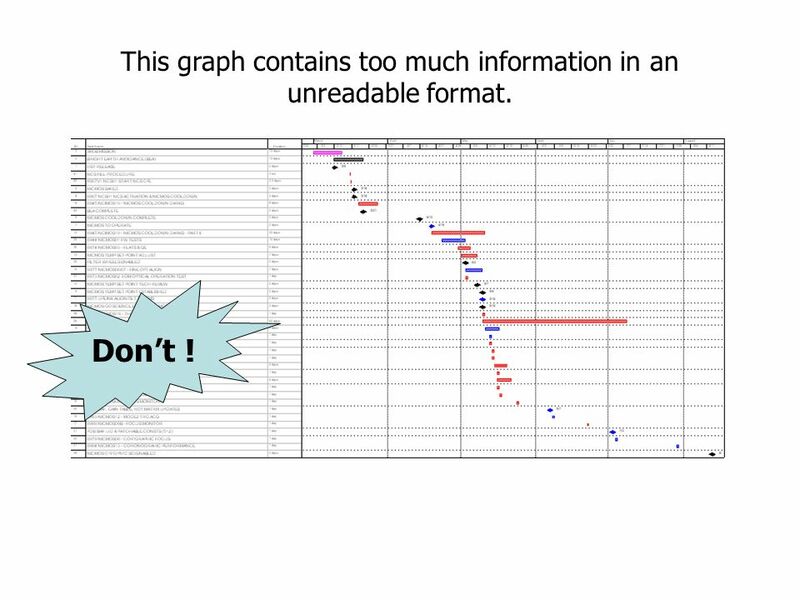 21 This graph contains too much information in an unreadable format. line widths and good colors. Do ! This is a good, readable table. Tables, especially large ones, should be placed on a separate slide. 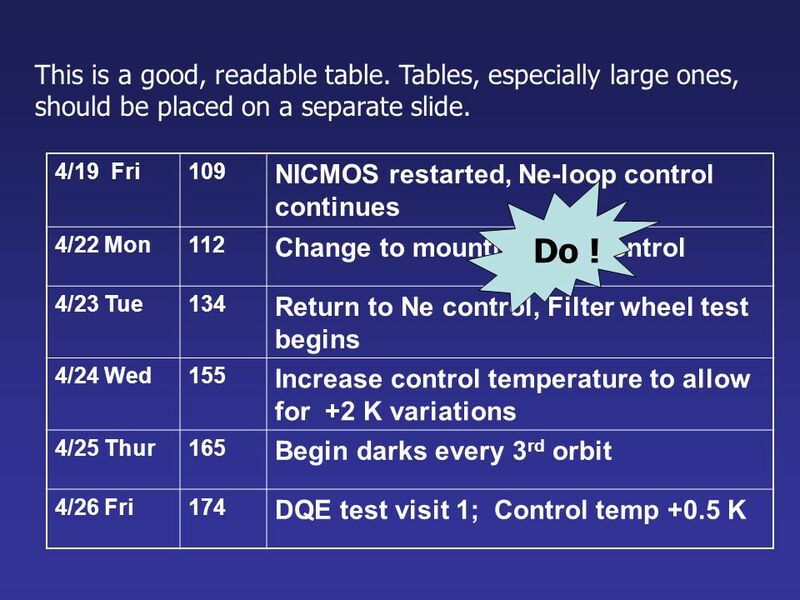 4/19 Fri 109 NICMOS restarted, Ne-loop control continues 4/22 Mon 112 Change to mounting cup control 4/23 Tue 134 Return to Ne control, Filter wheel test begins 4/24 Wed 155 Increase control temperature to allow for +2 K variations 4/25 Thur 165 Begin darks every 3rd orbit 4/26 Fri 174 DQE test visit 1; Control temp +0.5 K Do ! 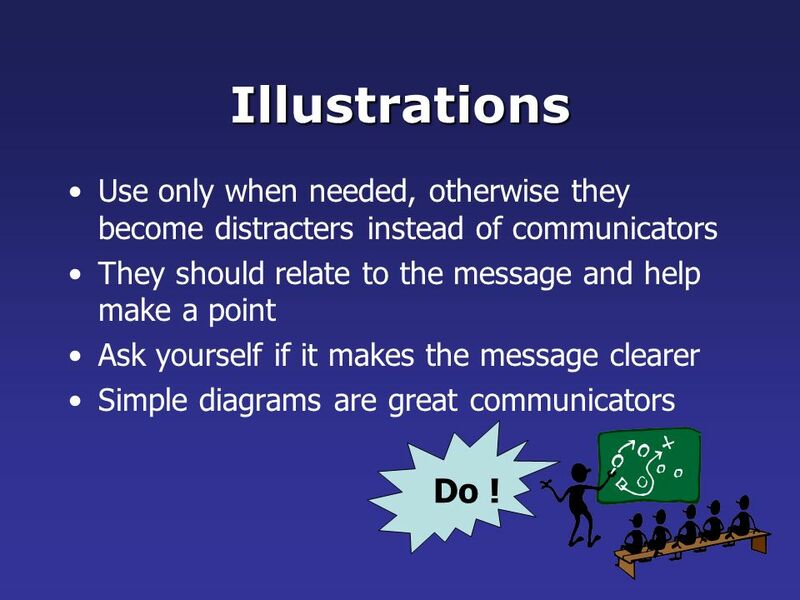 26 Illustrations Use only when needed, otherwise they become distracters instead of communicators They should relate to the message and help make a point Ask yourself if it makes the message clearer Simple diagrams are great communicators Do ! 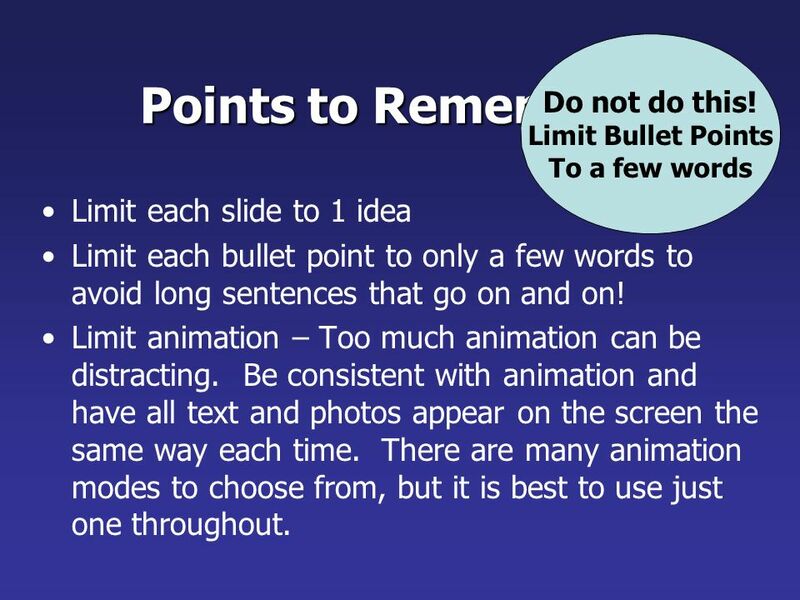 To a few words Points to Remember Limit each slide to 1 idea Limit each bullet point to only a few words to avoid long sentences that go on and on! 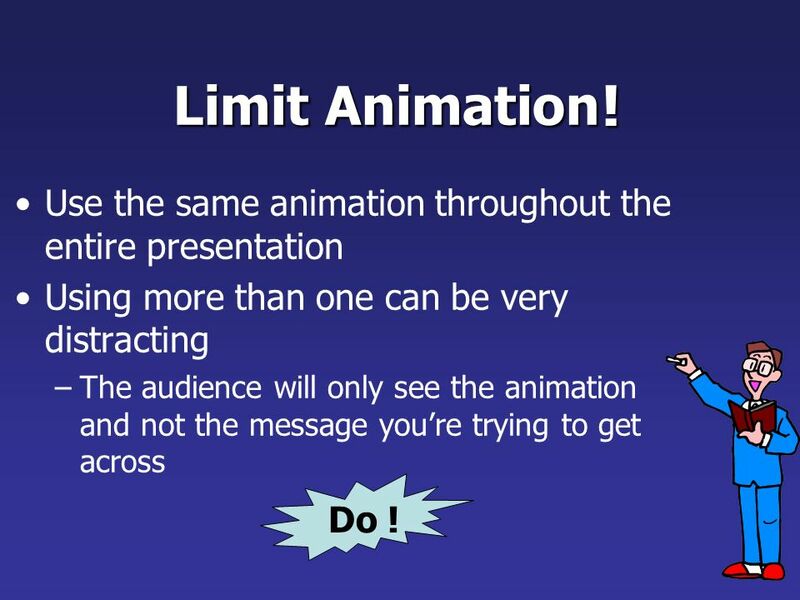 Limit animation – Too much animation can be distracting. 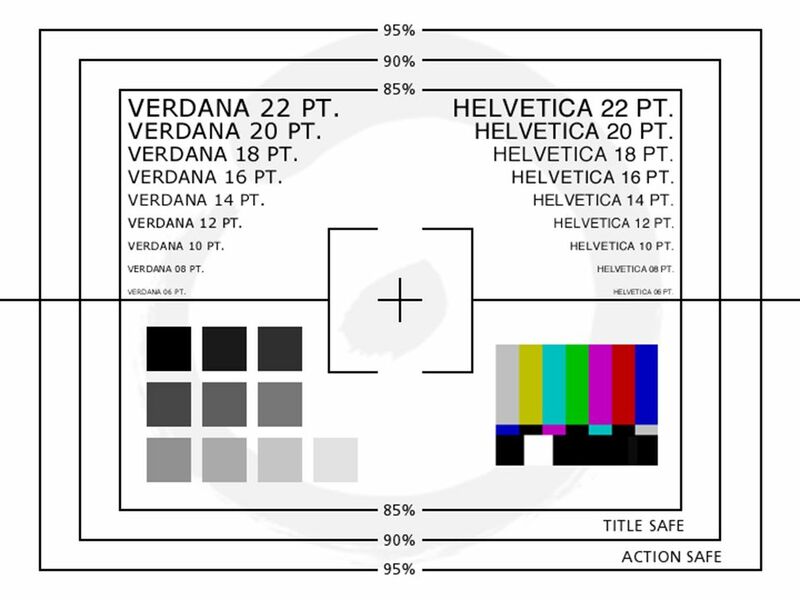 Be consistent with animation and have all text and photos appear on the screen the same way each time. There are many animation modes to choose from, but it is best to use just one throughout. 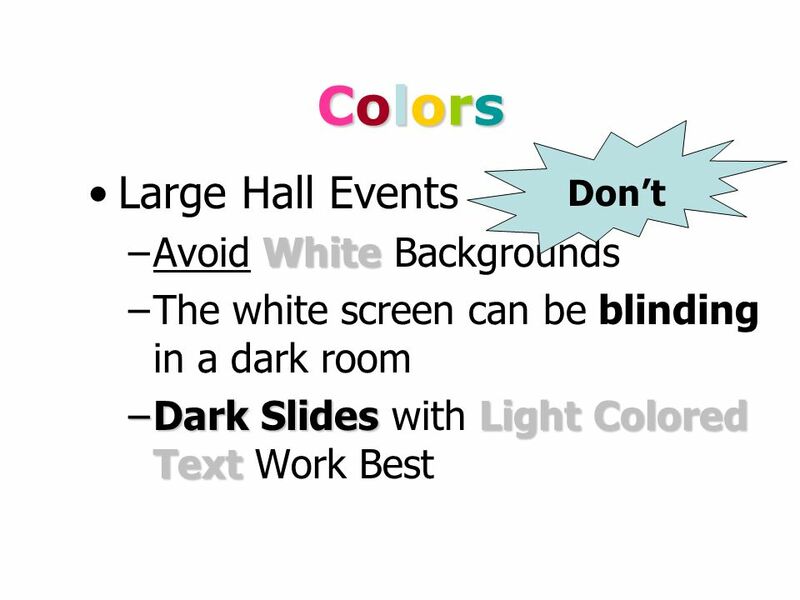 Use the same background for each slide Use dark slides with light colored text in large hall events Do ! 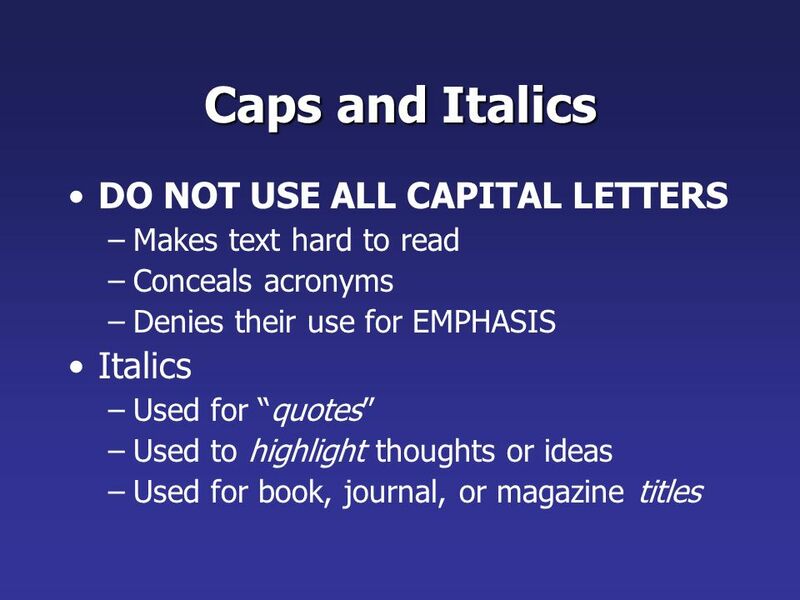 Don’t Avoid the “All Word” Slide Another thing to avoid is the use of a large block paragraph to introduce your information. 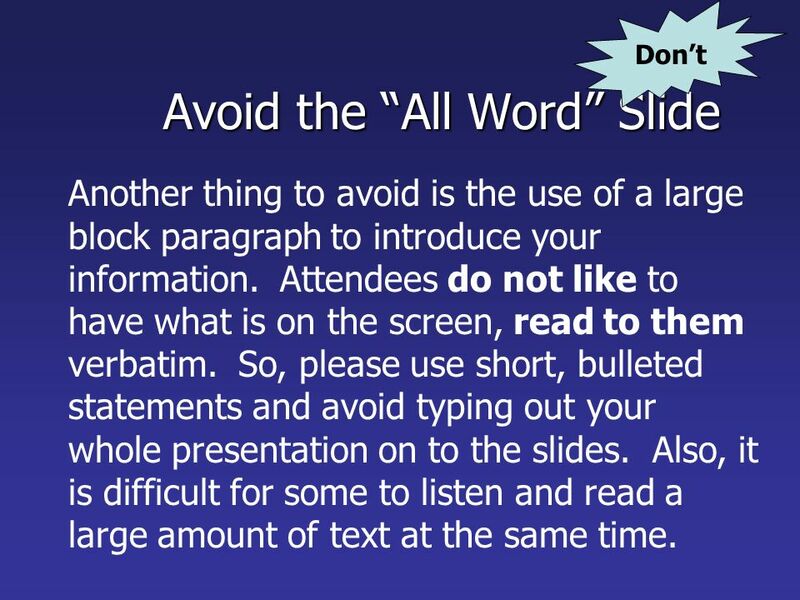 Attendees do not like to have what is on the screen, read to them verbatim. 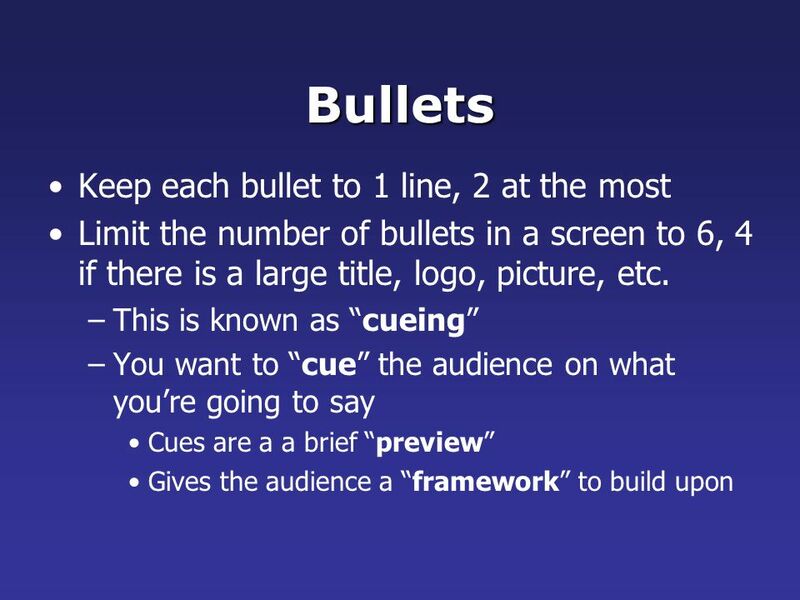 So, please use short, bulleted statements and avoid typing out your whole presentation on to the slides. 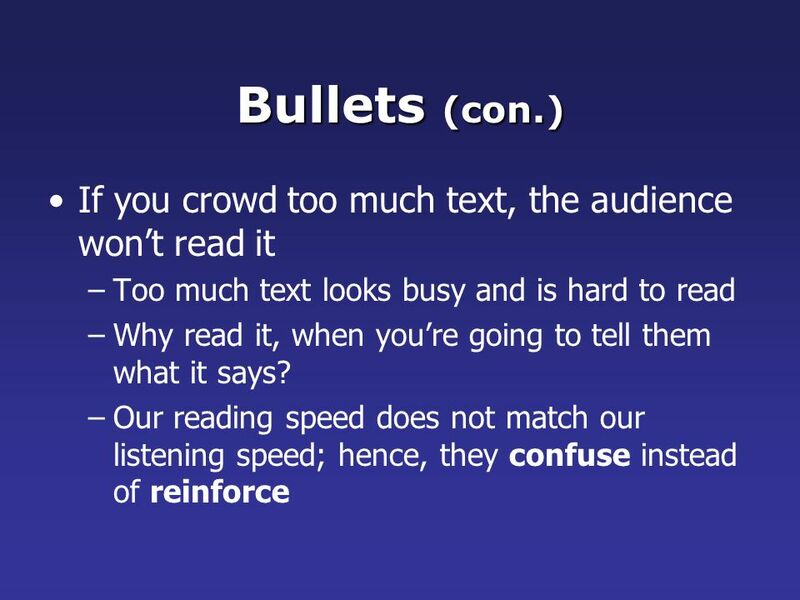 Also, it is difficult for some to listen and read a large amount of text at the same time. 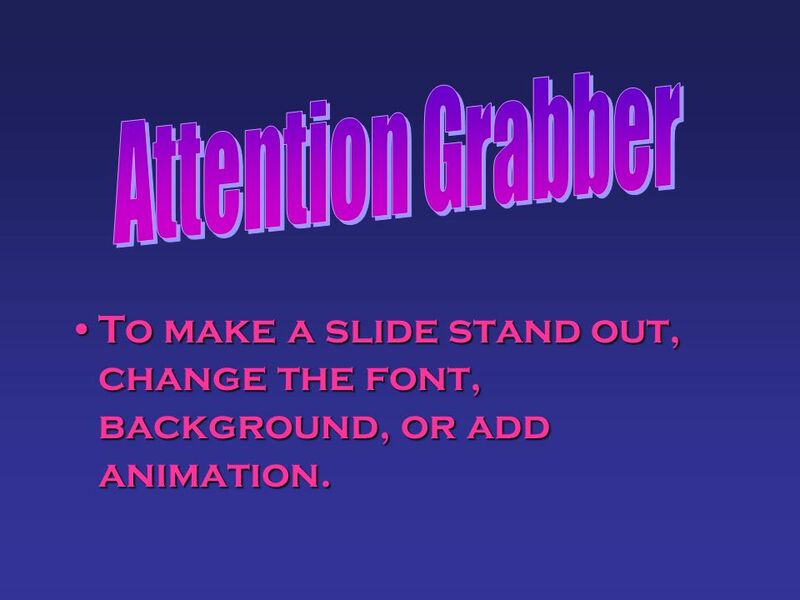 34 Attention Grabber To make a slide stand out, change the font, background, or add animation. 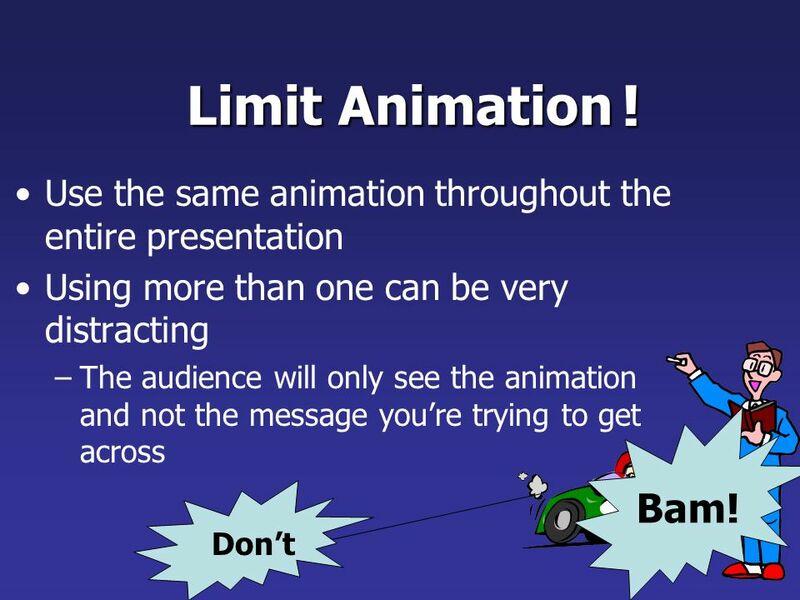 36 Limit Animation ! 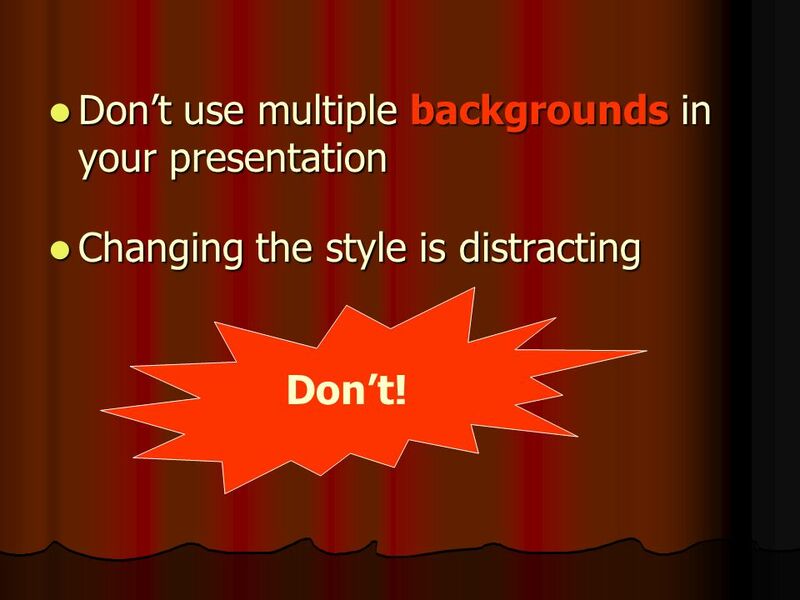 Use the same animation throughout the entire presentation Using more than one can be very distracting The audience will only see the animation and not the message you’re trying to get across Do ! 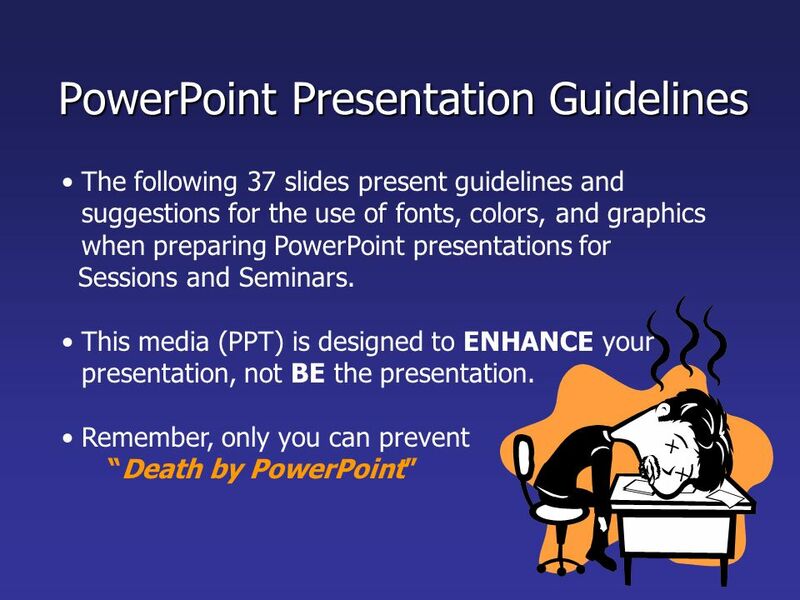 Download ppt "PowerPoint Presentation Guidelines"
Making Presentations That Audiences Will Love Use a Template n Use a set font and color scheme. n Different styles are disconcerting to the audience. Guidelines and Requirements for Computer Science Presentations Students can work together to prepare the presentations Each student must individually. 1 The design of presentation slides Stephen Bostock. 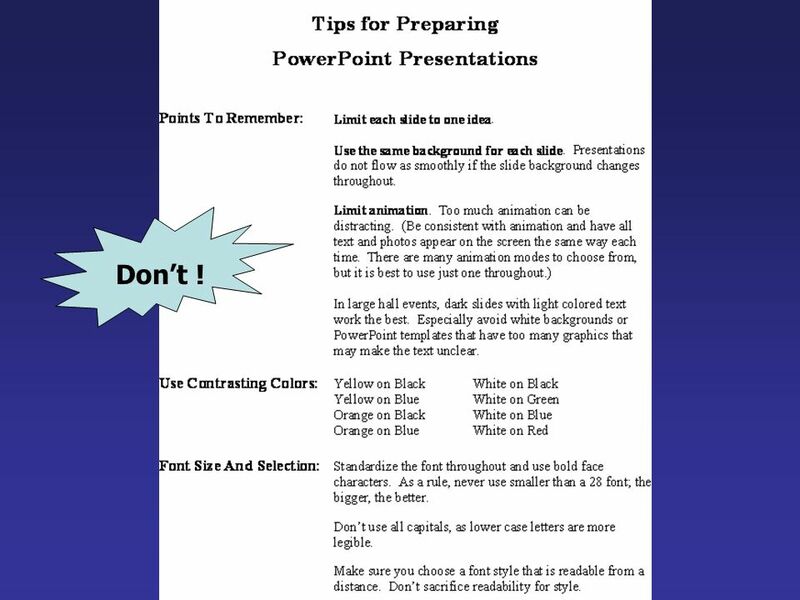 Use PowerPoint presentations to enhance the effectiveness of classroom instruction in many ways in every subject area. PowerPoint. 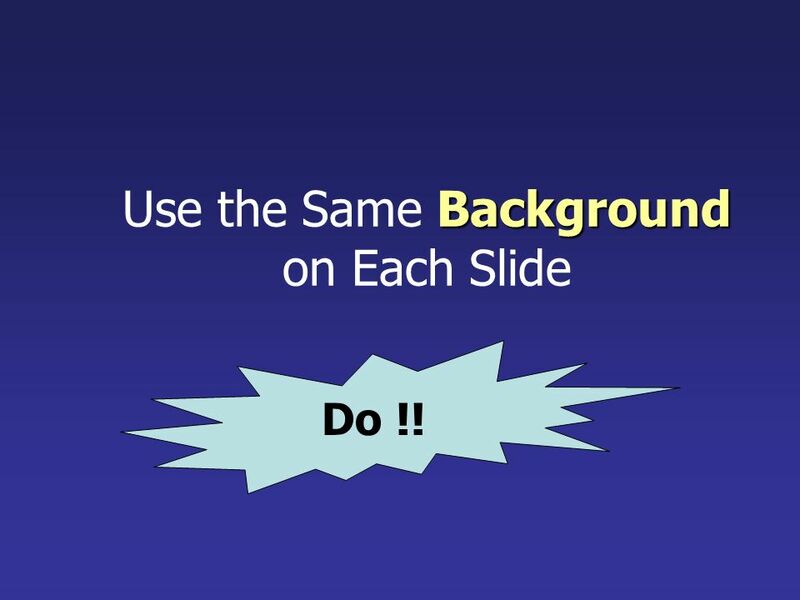 Guidelines for Preparing Slides Create A Title Slide To Introduce Your Presentation. 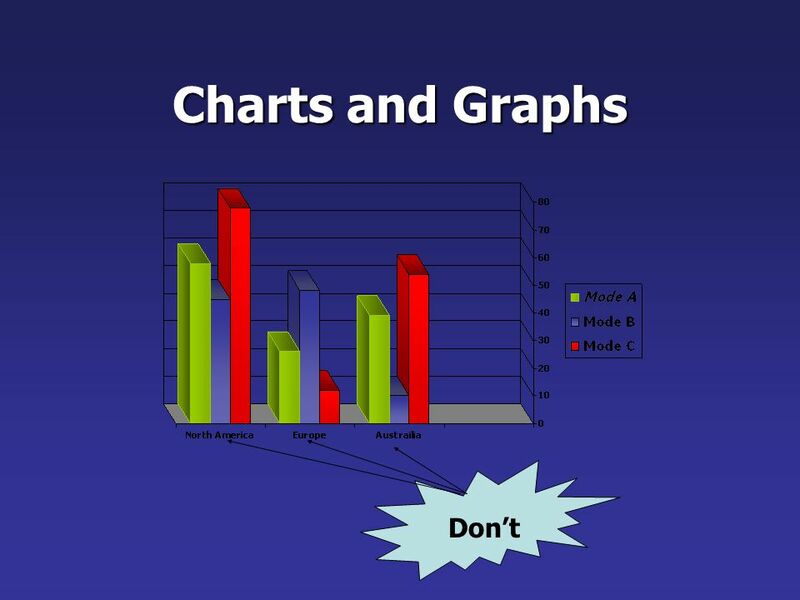 Copyright © 2013 The University of Adelaide Effective PowerPoint Design Peter Murdoch Learning and Quality Support. 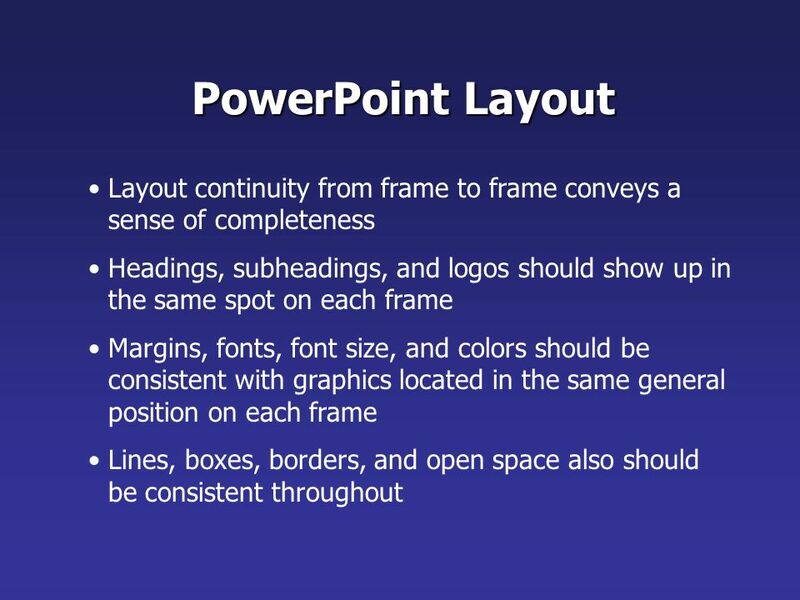 Making PowerPoint Slides Avoiding the Pitfalls of Bad Slides Revised by Mary Westervelt, Director SEAS Technical Communication Program. Copyright © 2014 The University of Adelaide Effective PowerPoint Design Peter Murdoch Learning and Quality Support. Law Enforcement Best Practice Manual For Fighting Against Trafficking of Human Beings The *.ppt file presentation. 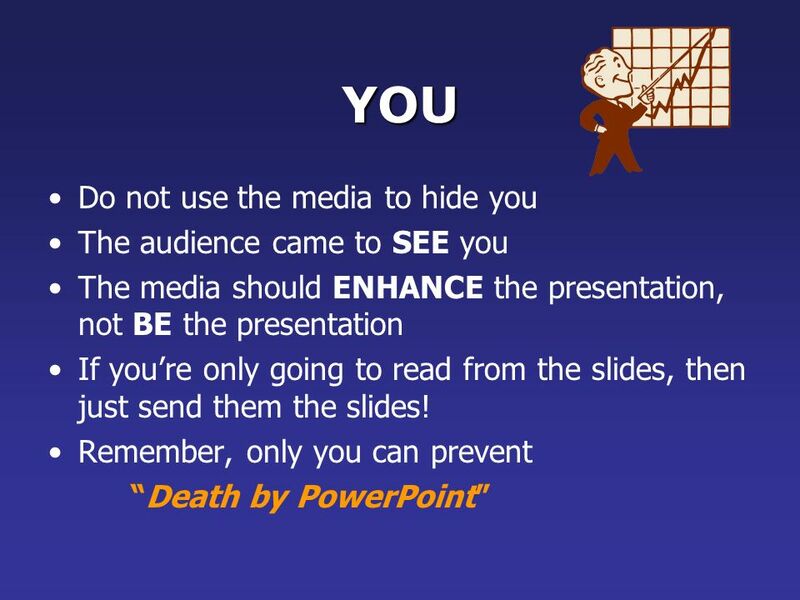 Basic Presentation Skills. Key Elements  Objective  Image  Capability  Common ground  Contents  Moderator guide. WARM UP In your notebook, brainstorm qualities of a good presentation. Think about what works for you when you’re in the audience. 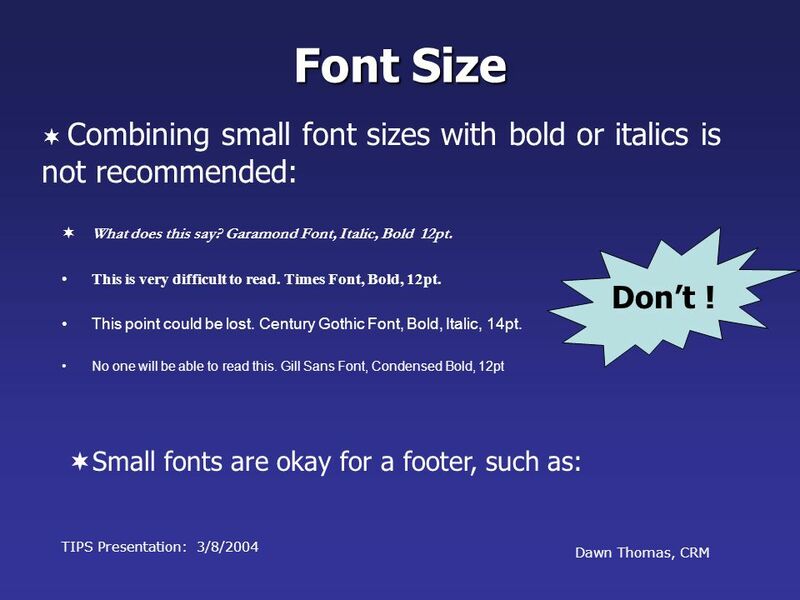 Design Guidelines Guidelines to help avoid common presentation mistakes. 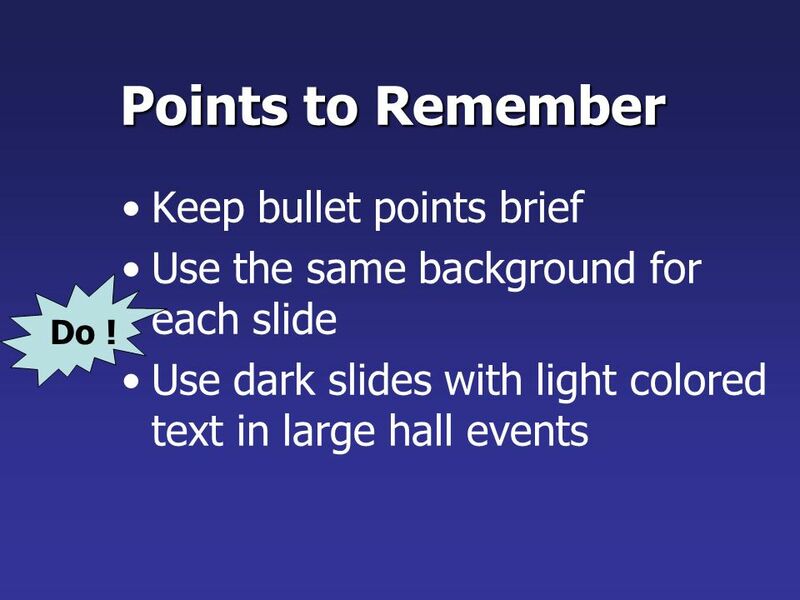 Making PowerPoint Slides Avoiding the Pitfalls of Bad Slides. 2014 EOS/ESD Symposium About this Template This is a template for presentations at the 2014 EOS/ESD Symposium It’s optimized for use with PowerPoint. Presentations That Work What’s here? What Do They Want/Need? What Do You Need to Do? Prepare Plan the Presentation Format and Delivery Manage Expectations.